Aptly referred to as the ‘Garden of France’, the 630km run of the Loire Valley and its namesake river represents a broad diversity of agricultural zones that produce food crops, flora, orchard fruit, and of course grapevine. With a 2,000-year history that spans early Gaulish, Roman, and then medieval French legacies, the vineyard-lined waterway is punctuated by an array of astonishing Chateaux and was named a UNESCO World Heritage site in 2002. Anchored by the city of Nantes, the western portion that’s closest to the Atlantic is the heartland of Muscadet wine making; marketed under the designation of Muscadet-Sèvre et Maine AOC. Here, a concentration of 23 towns and villages in the watershed lands of the Sèvre River and its Petit Maine tributary output about two-thirds of France’s total for this distinctive, varietal wine style. A combination of volcanic and alluvial soil imparts vital minerals that promote optimal vine growth, and the underlying beds of chalky limestone and gravel provide the required drainage in an often, damp maritime climate. Unsurprisingly, the flinty white wines that are produced under these conditions is a natural compliment to both the river’s abundance of freshwater fish and seafood of the nearby Ocean! This week’s DéClassé recommendation of Réserve du Chiron Muscadet Sèvre et Maine 2015 is fashioned from 100% Melon de Bourgogne grapes, which is the sole variety used to produce Muscadet. Initially imported by Dutch traders in the 17th century, the plantings around Nantes were primarily used for making ‘brandewijn’ – a distilled wine with added Brandy Spirits. After suffering a particularly hard freeze called the ‘Black Frost’ that killed off most of the region’s vineyards in 1709, King Louis the XIV is reputed to have ordered widespread replanting with a hardier variety then known as ‘Muscadent Blanc’. As a parent grape of the present day ‘Melon de Bourgogne’ cultivar, it has endured many stages of being in and out of commercial favour due to its relatively neutral nature. Somewhat more modern production techniques such as leaving the unfiltered wine stored in tanks on its lees (expired yeasts) over the winter months, the ‘Sur-Lie’ ageing process helps develop additional complexities of flavour, aroma and a creamier texture in the wine. La Cave du Coudray is demonstrably one of the region’s masters for this inherently lean wine style – evidenced by winning multiple Gold Medals at the Concours des Vins du Val de Loire and the Concours Général Agricole de Paris in 2016. If you’re a seasonal fan of refreshing white wine Spritzers during the warmer weather, then try uncorking a well-chilled Muscadet – and leave out the ice cubes and soda water! This pale golden-hued wine is delicately scented with stone fruit and citrus aromas, making for a zippy, mineral-edged wine style built around generous levels of acidity. Try serving with poached sole, stuffed trout, oysters, scallops or a cool crab salad – it’s also pleasing as a chilled apéritif with a lemon slice! 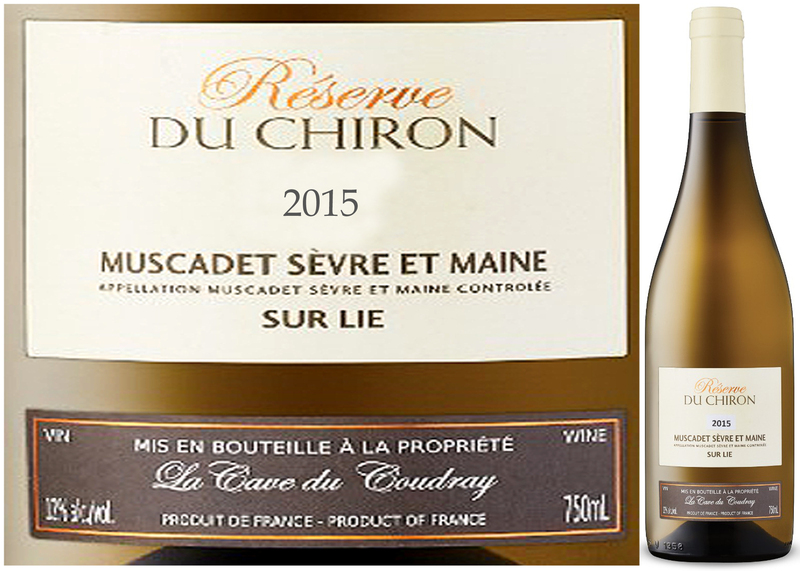 This entry was posted in White Wine and tagged La Cave du Coudray, Loire, Melon de Bourgogne, Muscadet Sèvre et Maine, Réserve du Chiron Muscadet Sèvre et Maine 2015 by Stephan Droege. Bookmark the permalink.